I went to the Remix My Lit masterclass at the Brisbane Writers Festival last week, and came away inspired! It was run by Amy Barker, author of Omega Park and the notes below come from her presentation and ideas. RemixMyLit.com is a project that took original works by authors licensed under Creative Commons. Then a whole load of new authors remixed them creating new works, also shared under the Creative Commons license. Some of the best works were published in an anthology, ‘Through the Clock's Workings‘, that can be downloaded for free here, a Creative Commons work you can remix and share to your heart's content. “It is shared under a Creative Commons Attribution Non-Commercial ShareAlike licence. What that means is you can remix the stories, but only if you acknowledge the author, the remix is not for commercial use, and your new work is available for others to remix”. Remix My Lit. What is remixing and why is it interesting? Remixing is a term more commonly used in music, where artists remix each others work, or fans do the same (the project uses the example of Trent Reznor Nine Inch Nails The Slip album). But it has been used in literature, most commonly with Shakespeare – endlessly remixed into films, stories, plays and other works. Baz Lurhman's Romeo and Juliet kept the language, but totally remixed the location, scenes and time to create a fantastic version. Shakespeare and other older works are in the Public Domain, out of copyright and available for anyone to use for any purpose. You can get free digital copies of Public Domain books at Gutenberg.org. Public domain classics include: Alice's Adventures in Wonderland by Lewis Carroll, Ulysses by James Joyce, Sherlock Holmes by Arthur Conan Doyle, and of course Pride and Prejudice by Jane Austen, most recently remixed as Pride and Prejudice and Zombies: The Classic Regency Romance – Now with Ultraviolent Zombie Mayhem! by Jane Austen and Seth Grahame Smith. This is a ‘novel as mashup‘, certainly more recognisable that Bridget Jones Diary (albeit a better looking Mr Darcy!). Whatever the literati think of these remixes, Seth Grahame Smith has made a lot more money than many, more original authors. He has 2 more books coming out, the next being “Sense and Sensibility and Sea Monsters”. There are also rumours of a movie! So you can remix/reuse public domain works, certain Creative Commons works and, I presume, other work you have express permission to use. So why is that interesting? Remixing is great for writing prompts and jump-starting creativity! If you need some inspiration for your writing, there is literally a world of ideas just waiting for your brain to create something new! That is pretty exciting. 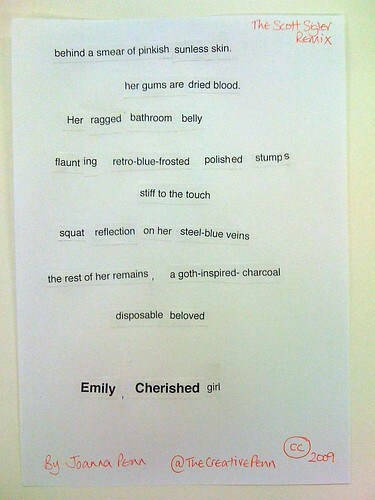 In the workshop, we did this fun exercise where we took the hard copy of one of the stories, ‘Cherished' by Emily Maguire. We then proceeded to do a ‘cut-up' – literally! We all cut words out of the story and re-pasted them into a remix, some taking the angle to preserve some of the original ideas, and others making something very new with the same words. You can read the original story in the free eversion here. It is short narrative. You can see all the remixes of the original stories here. Creative Commons: What Is It and How Can It Benefit You? This is such important information for authors online so please read and share! It is a version of copyright licensing, and it relates to your creative works. The basic Copyright law says that no one can copy or distribute your work, or use it, remix it or profit from it. This law becomes impractical in the digital environment where sharing, remixing, distribution and marketing are so important. Creative Commons licensing is a license you can put on your work to allow some of these things and make Copyright work for you and your creativity. Read this for the full lowdown on Creative Commons. You can license your work for different purposes. The main aspects are Attribution (you let others use/distribute your work but you must be attributed as the creator), Share Alike (you can use my work but you must share your own work too), Noncommercial (you can use my work but you can't profit from it), No Derivative Works (you can use my work verbatim but you can't remix it or change it). For more on the different licenses, read this. People can approach you for options beyond the license e.g. you have a novel released under Creative Commons which is Noncommercial but someone approaches you with a movie idea based on it that will be sold. You can still allow them permission. How can it benefit you as an author? On Piracy vs Obscurity. You need to make your own decision as to whether you want your ideas to be out there and used (and potentially pirated), or whether you want to keep them in a drawer where no one will discover them. If you want to be a successful author who sells books, you need to be known and the internet is the place to build your global presence. The risk of piracy is nothing compared to being unknown. Cory Doctorow addresses this in “Giving it away”, a Forbes.com article where he describes giving the ebook versions of his books away for free under a Creative Commons license. His sales increased but his books were also translated by fans and his ideas spun into new creativity. “Share your creative wealth and accomplish great things”. This is a quote from the video at the bottom of the page which explains Creative Commons in a great way. The internet has changed the way we produce and consume information. We all find ideas everywhere now. We put our thoughts and text online in the hope of building an author platform, or selling our books/products or finding an audience. Other people may get ideas from our work, and Creative Commons enables a legal way for them to re-use or remix it. 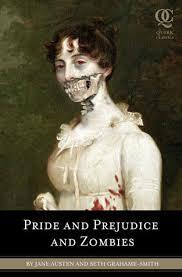 This has started in mainstream books now with the success of Pride and Prejudice and Zombies , a remix of Jane Austen. Is it fan-fic or a remix of a Public Domain book? Collaboration and Creativity. Expanding the theme of fan-fic and remixes, licensing under Creative Commons gives people the ability to take your work and recreate it in different ways based on your ideas. This could spread your work much farther than you could do on your own and may lead to some extraordinary ideas you can take and reuse in your turn. Is your idea your own? or can you release it and see what happens to it out there in the big wild? How can you license your work as Creative Commons? You can use this simple questionnaire to generate a licence. It will give you some code you can put on your site (in WordPress, just add a Text Widget to your sidebar). The questionnaire includes a country option so you can use it overseas. Advice from Elliott was: Have a really good think before you do license as Creative Commons. Are you really happy for people to use your work? Can they make money from it? Can they remix it? Only license once you are sure. How do I find other authors and creatives using Creative Commons? Google Books has listed books licensed under Creative Commons – check this post for more details. You can also license your tweets at http://tweetcc.com/ . Read the full article on CC for Twitter here. I have now licensed this site under Creative Commons Attribution-Noncommercial-Share Alike 2.5 Australia License, you can see this on the sidebar under my books. This license applies to the blog content and does not currently apply to my workbooks, Author 2.0 material and published books. This means that you can use my posts on your own websites, books and projects as long as you attribute me and this site as the original creator, share the work derived from it and don't make income on it. Start with this one and spread the word about Creative Commons! You can see all the international licenses here.